Kelsey Wilcox has had enough of cowboys. After the last one broke her heart, Kelsey traded in her boots for flip-flops, and the open range for a bistro on the beach. Her life on Corpus Christi's gorgeous beach might be a little lonely, but at least it's heartbreak-free. At least until her cousin's beachside wedding bucks Kelsey right back into the rodeo. When unlucky-in-love Brent Corbin packed his groomsman's tux for his friend's wedding, he brought his boots and belt buckle with him. Brent isn't exactly looking for love, but when he sees what appears to be a mermaid in distress, he jumps right in to rescue her. So Kelsey finds herself plucked from the sea--and certain-drowning--by a gorgeous groomsman...in soaked cowboy boots. She's quick to say thanks, but no thanks. Brent dedicates the weekend to pursuing Kelsey--and Kelsey spends the weekend trying to deny an obvious match. She's as stubborn as a wild horse, but Brent's determination may tame her yet. 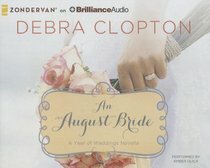 About "An August Bride (Unabridged, 3 CDS) (#09 in A Year Of Weddings Novella Series Audio)"